I was born in Tanuku (West Godavari) in 1972. I grew up in Vijayawada and did my schooling and graduation there. I came to Hyderabad to do masters in (English) and M. Phil. In 1998, I went to Canada to do masters in filmmaking. I came back in 2001. Since then, I have been trying to make a film. Grahanam happened in 2004. What influenced you to become a filmmaker? I come from a literary family as both my parents (Indraganti Srikanth Sharma and Indraganti Janaki Bala) are writers. My grandparents too are into literature. So there is a heritage of sorts. There was always been a fascination towards fiction. I have been reading ever since I can remember, a young age. We always loved watching films. I often watched movies with my uncle and afterwards we used to sit and analyse the good and not so good points. My grandmother was a very good storyteller. She used to narrate visually with intricate details often adding lighting effects to the narration. I think all these things subconsciously contributed to my interest in filmmaking. The foundation was literature. I started with Telugu and then ventured into English literature while doing my masters I have read all the greats in English literature. The first draft of Grahanam film was written in 1997. I was an amateur and was clueless about structuring a screenplay. My specialisation was screenplay writing after I went to Canada to study in a film school. After completion of the course, I redid the script. Then I went around to various producers. All of them were quite fascinated by the story, but because of their own ideas of what is commercially viable or not, they hesitated to take it up. Some producers were taken aback with the content. It was a desperate hunt for a producer for three years. Finally, I decided that to produce the film myself. When I made that decision, I went to Tanikella Bharani and told him that I wanted him to do a big role free. He asked me how I planned to do the film. Then he mentions that he had a few friends who would produce the film. 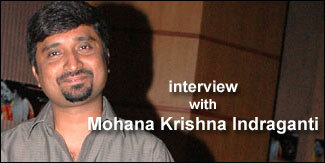 That is how the producers of Kanakadhara Creations came forward to produce the film. It took about three years of convincing different people for Grahanam to happen. What is the reason behind casting Jayalalitha in a key role in Grahanam? When I wrote the screenplay, I thought Jayalalitha could be the right choice. However, she has an entirely different image and is called by nicknames like ‘boring papa’ etc. When I was discussing with Bharani, he also came up with Jayalalitha’s name. When we spoke to her, she was very excited. She performed much better then what we expected. I also wanted to play on people’s expectations. Going by the content of the story, people definitely are suspicious about the character because of her earlier image. I also added a hint of intimate scenes between her and the boy so that audiences would begin to suspect that character. You got many awards for Grahanam. What about the commercial aspect? It was made on a shoestring budget. We call it a no-budget film, not even low-budget film! The transfer process (from DV to film) cost twice the budget of the film. Because it won the national award, the producers are safe. The sales of CDs and DVDs have picked up. A great achievement for Grahanam is being released in theatres like Prasads. I feel miserable about a film called ‘Yellamma’ made by Mohan Koda. It is an adaptation of Macbeth. It should have seen the light of the day. I hope that that will happen. It would have been an interesting film like Maqbool, which is also based in Macbeth. Yellamma was also selected for the Toronto Film Festival but could not be sent there due to financial constraints. What is the reason behind showing reality in black and white and dreams in colour in Grahanam? That dream sequence is the only personal moment of that character in the entire film. It is his memory of the woman. All the black and white part of the film is my narration. The colour part is the version of the character, which shows glory, beauty, and resplendence of the woman. I wanted people to see how beautiful she is in his memory. Are you satisfied with your work in Grahanam? Not really, I could have done better in many scenes. However, I am still proud of Grahanam. It gave me immense pleasure receiving the Gollapudi award from Aamir Khan. Aamir Khan generally stays away from film functions but he agreed to come and I am so happy about that. I won eleven awards including the national award and Nandi award. After doing Grahanam, I am not anxious about my career any more. If my commercial films fail, I can always go back and make films like Grahanam on a budget of 7-8 lakhs. Technicians and actors will work free for me if I want. My filmmaking will not stop. Grahanam showed me that I know my craft. How different is Maya Bazar from Grahanam? There is no connection between these two films. Grahanam is a very dark film with lots of grey areas. It is a much-focused film with a small cast, and shot on two locations. Grahanam was shot using a small camera in just nineteen days. The canvas of Maya Bazaar is vast. It is an entertainer. It does not allow any grey areas. I have always dreamt of doing a film, which would be appreciated. When I was a kid, I used to anticipate about the film, that I was going to watch later at night. I would like to make a film where the whole family is raring to go and watch it. I want films to have lot of colour, music, song, fun, meaningful story, lots of twists and turns, drama, visual effects and splendour the works in fact. Maya Bazaar satisfies us in some aspects I have mentioned. The story itself is a new idea. I am happy that the producer Satyanarayana gave me this commercial film offer after watching the preview of Grahanam. What is the story of Maya Bazaar? Maya Bazaar belongs to the genre of socio fantasy. What I like in the story is the seamless way in which you can mix both social element as well as the fantasy element. It also deals with the horrible conditions we are living in now and the mythological aspect that is linked to that occasion. It will relate events in real world and fantasy world and tells how we can improve ourselves. There is no preaching in the film. This film also gives interesting arguments about religion and God. Is it important to believe in God by forgetting our duties as human beings? Are we commercialising God? These things are dealt with in a lighter vein. This film deals with the aspects of ‘Myth, Money and Magic’. What is the reason behind casting Raja and Bhumika Chawla? If I cast an actor like Raja who is gaining ground now, the struggle the character goes through in film will be convincing. If I cast a big star in that role, people will not identify with that character. Raja fits the bill among the new generation upcoming actors. We had more reach to Bhumika, as producer Satyanarayana knows her very well because he made Missamma with her. . I needed a heroine who has stature and stardom for the female lead. Bhumika Chawla is beautiful and graceful. Her histrionics are good. Initially I worried if they could make an interesting pair together. Now I am very happy about their on-screen chemistry. What is your take on remaking old classics? I personally feel that if you are making the same story, it is a waste of energy. If I had to remake the old classy Maya Bazaar, it would be a non-starter from the word go. I have nothing to contribute. I personally am not fond of remakes. If you can present an extraordinary new angle to the old story, only then it is worth remaking. Why did you name your film Maya Bazaar (title of an old classic)? We were reluctant to title this film as Maya Bazaar during the scripting stage. When we narrated the story to Narasa Raju, he suggested that we should keep the title as Maya Bazaar. But we were convinced about the title when we complete the script. As a student of a film institute, what is your opinion on current trend of filmmaking? I always felt that our basic ideas are very good. Somebody said that Hollywood is a place where extremely talented people get together to make mediocre films. I found that writers in Telugu are supremely talented, but somehow they are caught in the trap of expectations. That is where we are losing out. Many people have a misconception that international cinema is art cinema and it is boring. But it is not like that. Crouching Tiger and Hidden Dragon was the biggest money-spinner. Some of the Chinese and Japanese films are huge commercial hits in the world market. We have such talent here. With the kind of talent we have we can make hundreds of Lords of The Rings. Each story of grandma and that of Chandamama Katha can be made into very interesting films. What we require is vision. If producers give us some time, we can make good films. Producers are going after combinations of hot stars and hot directors. They make up stories by taking bits and pieces from different hit films in recent times. Most of the producers are interested in making a quick buck as soon as possible. We have talent, potential and money. We can afford to be little more adventurous instead of doing mediocre films. We should have a scientific approach towards filmmaking. I meet lot of writers who have interesting ideas. They are struggling in developing those ideas into plots. If they have ideas, they do not know how to structure a plot. Some tools will help in these situations. They should learn the craft. We should have good film institutes in Hyderabad. I am happy to know that D Suresh Babu is planning to come up with a film institute in Hyderabad. We do not have any references or yardsticks for great cinema. The previous blockbuster becomes the yardstick. Right now, producers want to do films like Pokiri and Bommarillu. We need to see beyond boundaries. Check out films like Crouching Tiger and Hidden Dragon, Hero, House of Flying Daggers etc. What about the commercial aspect? There were instances when good and creative films failed at box office? To my knowledge, most of the well-made films were commercially successful. The audiences have accepted experiments. There are some instances where a director was ahead of the time and films failed. If the director and producer promote the film well, experimental cinema will reach the crowds. I want to do a murder mystery. It will be a genuine psychological thriller. I want to make this film in European and Japanese style. I also have many literary adaptations lined up. I think films from Far East fascinate you. Yes. The most provocative films in the world today are coming from Japan, China, Korea, Iran, Iraq, Turkey etc. Don’t you want to work with stars in high budget films? I love to work with actor-stars. For example, I like Mahesh Babu a lot, because he is an actor first. He is a born star. When I saw him in Takkari Donga I felt that he has what it takes, an inborn star quality. He does not have to fake it because for him it is instinctive. Mahesh belongs to the category of born stars like Brad Pitt, Johnny Depp, and Leonardo DeCaprio etc. He is also a very promising actor who can do a whole range of characters. I would like to work with actor-stars like Mahesh Babu than a simple star with a mass following. I would like to make a film with stars that would take Telugu cinema to world stage. It has to have an international appeal. It should be appreciated by the critics and be a commercial success. What books do you recommend on filmmaking? Robert McKee’s ‘Story’ gives the most precise and useful account how to think about a story and conceive an idea. It also teaches about various stages between conceiving an idea and writing screenplay without being mechanical. Another book I recommend is ‘The way of screenwriter’ by Amnon Buchbinder (my supervisor at film school). He gives a reader friendly account of the agonies a director goes through while writing. I also recommend ‘Filmmakers Handbook’. Among the current crop of actors, Mahesh Babu is my most favourite. He is a natural. Among the actresses, I like Bhumika Chawla. In Hollywood, I like Johnny Depp and Morgan Freeman. Jodie Foster, Meryl Streep, Kate Winslet and Julianne Moore are my favourite Hollywood heroines. KV Reddy is my all time favourite. He is the master of cinematic grammar. He is the William Wyler of Telugu cinema. I learn interesting things from individual directors. I like K Viswanath’s staging. I like Mani Ratnam’s visual style (especially in Iruvar). I like Ram Gopal Varma for bringing back realism to mainstream cinema. My all time international favourite director is Akira Kurasowa for the sheer variety he is into. He is a complete filmmaker who could do a very small budget film and a super lavish war film like ‘Ran’ at the same time. His range of films is awesome. Do you have any suggestions to the aspiring filmmakers? Get the basics right. If anybody tells you that you do not need formal training to become a filmmaker, don’t believe them. Training always helps. If anybody tells you that they know the secret to commercial film success, don’t believe them. Nobody knows it. The only way is to work hard and go by your conviction.